International Yoga Day might be a one-day fad for some but for those who practice yoga regularly, it's an experience they cannot do without. Art mirrors life and Bollywood has a take on everything. Yep, even the ancient science of balancing body, mind and soul. Don't have money to spare for classes? 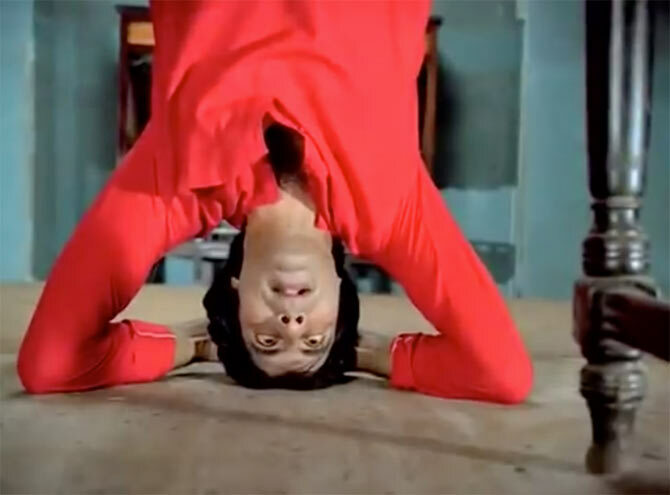 Learn an asana or two from our good ol' Hindi films. Two things to note here. Wow, Hema Malini is nimble! And boy, that's helluva lot kajal for an at-home workout. There's a lot to watch and learn from the shapely Parveen Babi in leotards and tights as bouquet bear Amitabh Bachchan finds out in one of his many awkward moments of Namak Halal. Having said that, AB is one quick learner. That, ladies and gentleman, is what you call Sirsasana. Even the chirpiest of stars abandon their Khullam Khulla ways to seek inner peace like Neetu Singh in Yaarana. No wonder she's maintained herself so well even in her late 50s. If one could only stay fit by merely watching Aishwarya Rai Bachchan in action, the world would be such a healthier place. Stretch, bend, lunges, this elastic beauty can do it all. Flaunt your lithe figure and some freestyle yoga poses like Urmila Matondkar by the sea in order to grab eyeballs, hopefully from someone in showbiz, to get that big break in the movies. God knows Jacqueline Fernandez tried. All she got for her awe-inspiring agilities is one of the biggest flops of 2015. Concentration is the key to meditation. While Deepika Padukone and Diana Penty's is committed to yoga, Saif Ali Khan's single-minded focus lies in beer and babes. Baba Sanjay Dutt dispenses gyaan on Nagna Yoga or Naked Yoga -- it's not made up -- and a semi-clad Kangana Ranaut and foreigner extra are more than happy to demonstrate. Psst... Pahlaj Nihalani wasn't appointed CBFC chief at that time. Bollywood's desperate need to insert glamour and crazy logic in everything translates to a sexed-up yoga camp inhabited by folk in itsy-bitsy figure-hugging attire, performing faux asanas in a open-air setting of chilly, mountainous Canada. Kareena Kapoor and Abhishek Bachchan travelling all the way to New Zealand just to breathe in and breathe out and stretch their loooong arms is the height of dedication. Tiger Shroff's version of the self-pairi pauna asana, wearing snug denims, no less, is all kinds of cool. Lessons from Bollywood: Wearing wigs like AB, Rekha & Ash!